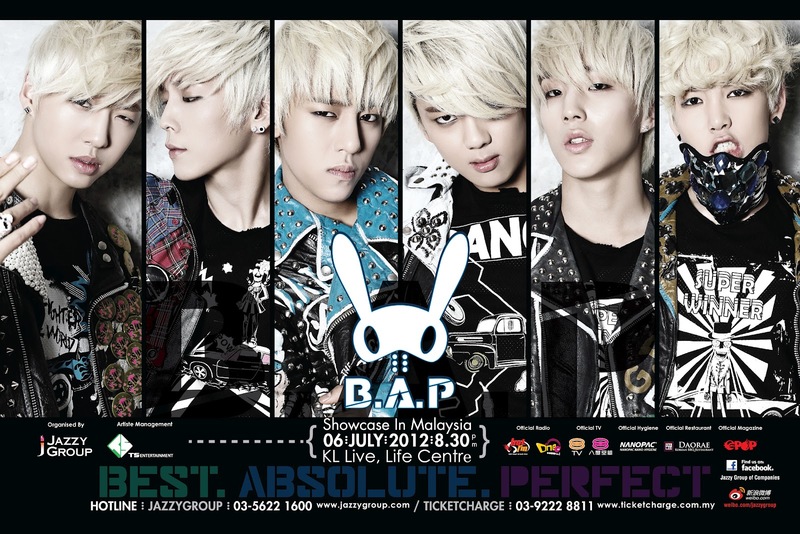 Jazzy Group proudly announces that we are the organizer of 《B.A.P Showcase in Malaysia》. 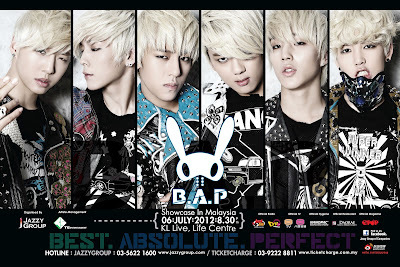 The showcase will be held at KL Live Centre, Kuala Lumpur on 6th July 2012 (Friday), starting from 8.30p.m. Come and enjoy watching their great dance performance and amazing voices that will definitely rock you throughout the night. This is their first time to be on stage as B.A.P and meet-the-fans in Malaysia. They receive a lot of attention and rise their popularity not only in Asia but also America and Europe since their first debut with the single “Warrior” in January 2012. In April 2012, B.A.P made a comeback with their second EP entitled “Power”with the lead single of the same name. B.A.P is a six member boy band formed by TS Entertainment in year 2012. The group consists of Bang Yong Guk (leader), Kim Himchan (rapper and vocalist), Jung Daehyun (main vocalist), YooYoungjae (lead vocalist), Moon Jong Up (main dancer and vocalist) and Choi Jun Hong (Zelo – lead rapper and lead dancer). Amazing performances is specially brought to you in town, come join us on 6th July 2012 and be the first to grab your ticket. Ticket price range listed as RM303 (VIP)(Limited Ticket)(only available at Jazzy Group office), RM203(Rockzone A), RM203(B.A.P Zone)(UpperTier), RM103(Rockzone B), RM83(Rockzone C)(*ticket price including RM3 processing fees). See you there! v The first 100 fans who purchase VIP ticket at Jazzy Group office will get a B.A.P poster + to be on stage to get FANSIGN. v The first 100 fans who purchase Rockzone A-Rockzone B ticket will be given 10% discount + 1 piece B.A.P poster. (Term and condition apply). Tickets are available at all Ticket Charge outlets ticketing counter and Jazzy Group office only. Stay tune with Jazzy Group Facebook and official radio station One FM& Hot FM for their latest news update.